Congratulations to the following Sherrard Roe Voigt & Harbison attorneys who have been named the Nashville Business Journal’s Best of the Bar for 2014. The Nashville Business Journal took nominations from the public for two months. Eligible nominees then participated in two weeks of private voting, allowing the nominees to vote on one another. This process is designed to find out which nominees truly are the best of the bar, according to their peers. The result is 80 total winners in four categories based on employee size. Per capita, more lawyers than any firm listed. 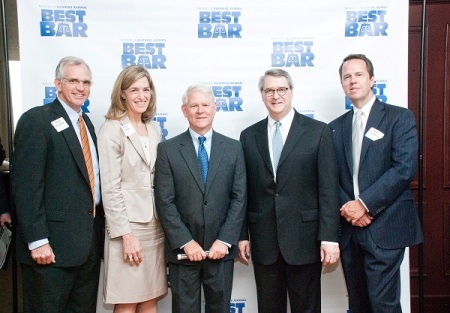 The Nashville Business Journal hosted a cocktail reception honoring Nashville’s Best of the Bar winners. The reception was held June 26 at the Nashville City Club. Pictured left to right: Dewey Branstetter, Carolyn Schott, Kim Brown, Bill Harbison and Webb Campbell. Not pictured: Mike Kaplan, Tom Sherrard and John Voigt.